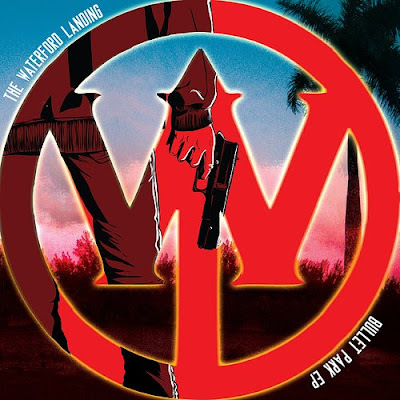 Miami based electronic band 'The Waterford Landing' have just released 'Bullet Park'. This EP is their follow-up to their excellent self titled debut album which they released a couple years ago. 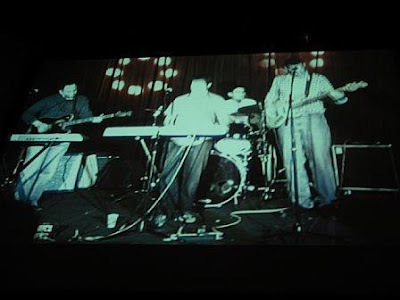 I featured 'Skylark' a dark/synthy dance track from their debut on a PopLife Compilation CD in 2005. They also won Best Electronic Act in 2006 by the Miami New Times in it's popular yearly 'Best of Miami' Issue. Not too shabby for these local musicians who have been at the game, albeit with different projects for awhile. Their first album was more of a New Order/classic electronic sounding affair. This new 5 Song Bullet Park EP sees them experimenting a bit more and trying out new things. Some songs are more pop oriented 'Folksong #1', 'Theme from Through the Night', some more experimental 'GetBent', 'Bullet Park'. One thing's for sure they're definitely growing as a band and trying to push the envelope, which is what every artist should strive for. Great comic book style artwork by Dan Goldman as well. Go to their website at www.thewaterfordlanding.com or their myspace link above for more. My favorite track so far is the intrumental opening track 'Theme from Through the Night' and the self titled closer Bullet Park. I'm only gonna put these on YouSendIt, so they'll be up for a week or so. Get'em while they're hot! You can buy their EP & album online at CD Baby. Here's the sleek sounding Skylark from their debut album. Great tracks! Never knew they were from Miami. I remember hearing them constantly on WVUM. I love Theme From Through the Night! Sounds like the soundtrack to a spooky Miami Vice episode.